The timeline is such a point of contention. 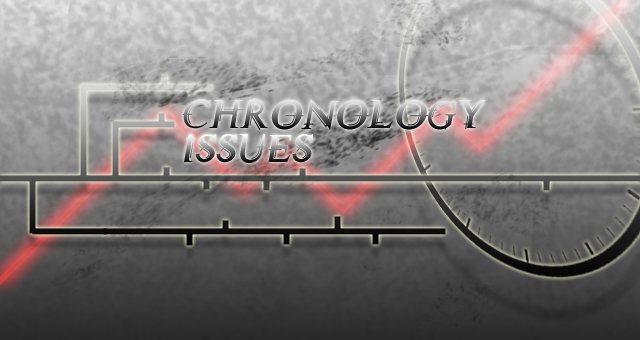 The quest for finding an overall chronology is so important to many people. The funny this is, I haven’t mentioned Zelda yet, but I’m fairly sure you’re all thinking about the Zelda timeline. Fair enough, given that this is a Zelda fansite, but at any other Nintendo site majority of people would have had the same reaction. Even at general gaming sites, mention the word ‘timeline’ and a fair proportion of people would think about Zelda. But why Zelda? What makes the Zelda timeline so special? What about Pokemon, Metroid or Mario? In a lot of series there is a straight flow, a direct correlation if you will, between release date and chronological placement. The first game starts it, then comes the sequel, then the sequel to that and so on. Maybe they’ll whack in some prequels on occasion, but it’s fairly standard stuff. Not with Nintendo however, they like things more complicated. Perhaps the easiest of the Nintendo chronologys is Pokémon. All you need to know is that the games like Black and White are parallel, and that generation one and three occur simultaneously, as do generations two and four. Other than that it is all pretty certain where and how everything occurs. The backstory right back to creation is covered. People don’t need to dispute, theorize and discuss Pokémon games because they are set. No question. Metroid is similar in the regard that the timeline is determined by its makers. The timeline isn’t determined by release dates, but the placement of each and every game is set and known – often before its release. With Other M just recently, there was never any question as to its placement between Super Metroid and Metroid Fusion. That is how Metroid works – games are given definitive placements on the timeline. Then there’s Mario. Where do I start here? There isn’t a timeline, but who even cares? There are so many Mario titles, so many spin-offs and appearances of the characters. The Mario series epitomizes Nintendo’s philosophy that gameplay is much more important than storyline. What else do we play Mario for? Besides a Mario timeline would be pretty pointless, seen as the stories hardly ever change. Daisy’s first kidnapping, Daisy’s second kidnapping, Peach’s first kidnapping, Peach’s second kidnapping and so on and so forth. Super Mario Galaxy 2 follows Super Mario Galaxy, we know that. Some fans do try and create a full series timeline, but it hardly means anything. We tend to be seeing two general timeline norms here. The first is that the games are in a set order decided by the creators. The second is that timelines are irrelevant, as it is the individual games that matter. Where does Zelda fit in? It looks to be in a category of its own that is in the middle of those two categories. It is a series where the developers claim to have the infamous ‘timeline document’, but at the same time say that individual gaming experiences are more important. We have Zelda games like the five major console releases and the two DS titles that form the timeline’s foundation. They make the split that is what the developers have determined for us. Then we have little other connections here and there like The Four Sword Series and the original duo, but everything else, that’s up to you. How do the games fit around each other? What is the reasoning? What explains this massive loophole here? The Zelda chronology is different to all others in that it is up to the players. We can ask why, but the answer to that is much like the Zelda timeline itself – completely up to you. We could say that the creators like not having to limit their creativity to such a fixed chronology. We could go on about how it is the ‘legend’ of Zelda – just a collection of related myths and legends. We could say that gameplay is more important than storyline – but what do I think? I think in Zelda storyline is all the more important than gamplay. Zelda is for people who don’t like things being handed to them on a silver platter. They like having to think, having to problem solve and having to work it out for themselves. Zelda is what we make of it. We get to make the connections and theories – that is one of the things that makes Zelda so much more than just a gaming experience. We can spend time complaining about the Zelda timeline, but its ambiguity makes it so much better than any other series’. The Zelda timeline is just the way I like it – different, confusing, frustrating, and a hell of a lot of fun to try and make sense of. I wouldn’t have it any other way. History of the Pokémon World on Bulbapedia – Detailed timeline of events in the world of Pokémon. Legends of Hyrule by Ben Lamoreux – Explores the literal legend theory of the Zelda timeline.